Did you know that rock salt or other ice melting products can damage your floors inside your home? If you are using ice melting products on your walkway, driveway or porch, it is imperative to limit as much as possible the exposure of these products to your home’s carpets, rugs, and floors, including hardwood and vinyl. Rock salt and “ice melt” is easily tracked into your home from the out-of-doors. This can ruin carpet fibers and markedly increase wear on your carpet. It is grimy and makes your carpets and rugs look dirty, as well! In addition, these gritty substances can scratch and nick your hardwood and other flooring. Have people take off their shoes before tracking in your house! Place a special mat or even a couple of old towels for family and guests to place their shoes upon entering your house. Place doormats at all of your entrances right inside the door and vacuum them frequently. Honestly, it’s a good idea to have a couple of inexpensive replacement mats during the winter. Vacuum your area rugs and carpets often — salt product particles can very quickly penetrate deep into the carpet fibers. If you have any questions or carpet cleaning needs, as always feel free to contact Cincinnati Maintenance! Lots of people ask me how to store an area rug. Either they want to redecorate and don’t want to get rid of a favorite rug or they are moving and need to temporarily store it away — whatever the reason, there are a few things you should know before you store your rug — whether it’s in an attic, basement or in a storage unit. Never store away an unclean rug. Never, ever. First of all, you don’t want to attract any bugs or pests with an unclean run. Finding a pest infestation in a rug you painstakingly stored is a nightmare. Be sure to have the rug cleaned to remove all dirt, soil and grime. This not only helps repel any insects but it also saves the rug fibers. Storing a rug that has been properly cleaned also helps protect against dry rot. The key word here is properly. If you DIY, be sure there is no type soapy residue left in the fibers. Lastly, please never, ever store a rug that is damp in any way. This will lead to mold, mildew, odor and big trouble. Depending on the space you have to store your area rug, you will need to face the decision: to roll or not to roll the rug. Folding rugs can help save on storage space but can also cause major stress to the rug fibers. If you absolutely have to fold a rug, you can try to minimize the stress by having the rug folded with fibers facing outward which means the foundation will bend a little less. If you are able, it is a good idea to roll the rug tightly. Again, to lessen the stress on the fragile or antique rugs, try to roll it with the fiber pile on the outside. 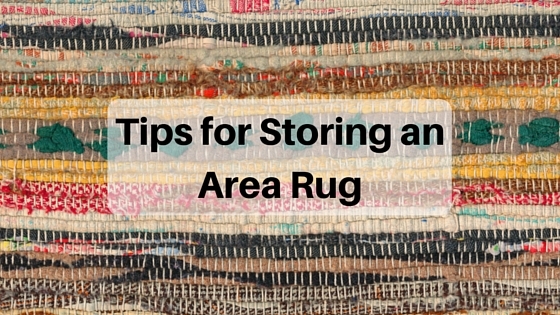 Less fragile area rugs can be rolled just fine with the fibers facing in. Some people choose to wrap the rug in paper, which is fine, but discuss with a specialist which type of paper would be best, because you don’t want paper that bugs really go for. Rolling a rug in plastic is not the optimal choice because it can trap moisture or create moisture through condensation. Sometimes plastic can even cause rugs with any wool content to “sweat” and that creates a bad odors or, worse, the dreaded mold and mildew. If at all possible, store your area rugs in a climate controlled storage unit or space. Do not place items on top of a stored rug. Crushing the rug in this manner can damage the rug’s foundation and lead to cracking and other problems. If we at Cincinnati Maintenance can ever answer any questions for you about storing your area rugs, please don’t hesitate to contact us.